We gather today to honor the memory of Dr. Jaroslav Němec. I believe the best way for us to do that is to recall his ideas and lifelong efforts, which he ultimately put into creating the Czechoslovak Society of Arts and Sciences (SVU) in the United States. From a historical perspective, we see two essential elements in the life of Jaroslav Němec. One was a love, largely romantic, for his native region, Moravské Slovácko, and especially the communities of Ořechov and Polešovice. In his youth, the outlet for this love was a Slovácký kroužek, a circle of friends who cultivated and sang folk songs, especially those from Moravské Slovácko. Jaroslav would form such a circle wherever he went and stayed for a time, as he did in Brno, where he was a student. It was the same in Washington, where, before SVU, Jaroslav formed a folk song circle and gave it his energy and leadership. 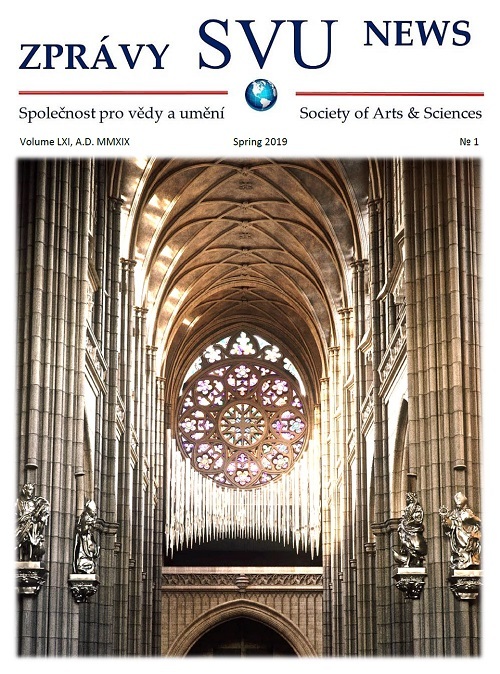 His passion for music and the songs of Moravské Slovácko was evidently a spiritual legacy from the elder Jaroslav, his father, who was headmaster at the public school in Ořechov, where his son Jaroslav was born in 1910. No doubt the father’s historical writings were the source of Jaroslav’s ambition to write a detailed and complete history of his native town. To that end he devoted years to a close study of its historical sources, back to the earliest ones. The result was four volumes, the first published in 1972 with the title Ořechov u Uherského Hradiště, léta 1131-1649 (Ořechov near Uherské Hradiště, 1131-1649). The next two parts, which take the history of Ořechov and the places around it up to the present, are going into print, as I just learned from Jaroslav’s wife, Ludmila, while the final part, an index, awaits just a few revisions and will then be ready for publication. The other motif and constant in Jaroslav’s life was his devotion to the Republic. It came from his conviction that the Czechoslovak Republic, standing on the ideals of Thomas Masaryk and Rastislav Štefánik (recall that Jaroslav was from Moravské Slovácko, like Masaryk), embodied the best historic humanist traditions of both nations and their contributions to the growth of Western civilization. In this regard, we can dwell on a passage in Jaroslav‘s book about Ořechov, where he critically examines the events of the 15th century—the time of Constantinople‘s fall and America’s discovery—and finds that “In our lands, however, it was the book that defined the New Age.” For Jaroslav, the most important event in the 15th century was the invention of printing, an invention to which a Czech printer contributed even before Gutenberg, as Jaroslav showed in one of his writings. Jaroslav made his devotion to the idea of a free and democratic Czechoslovak Republic clear after its occupation by Nazi armies, when he at once joined the military resistance group Obrana národa (Defense of the nation). He had to go into hiding soon after, in November 1939, to avoid falling into the Gestapo’s grasp. He eventually got to France, where he joined the Czechoslovak Army to take part in the armed struggle to restore a free Czechoslovak Republic. After the fall of France, Jaroslav came with the Army to England and later was sent to the Soviet Union as part of the Czechoslovak judicial service. He did not know then that just a few years after the Republic’s liberation, he would have to leave it to fight again for its liberation, this time from the Communist yoke. At stake was the outcome of a global clash of ideals and their impact on politics, economies, cultures and civilization everywhere. This was the situation when Jaroslav arrived in the United States. And it did not take him and his several friends long to realize that if they were to make a real difference in this struggle for a free and democratic Czechoslovak Republic, then they would first have to show our American compatriots that we do not come from some dark corners of Eastern Europe, that our culture and civilization were part of the Western world from the beginning. It may seem incredible today, but in the early 1950s, as Dr. Němec wrote, our standing in the free world was no better than at the time of Munich, when Chamberlain called us a people about whom he knew nothing. And what Chamberlain did know about us, the Czechs and Slovaks, was, as Němec added, mostly not objective. So, it was clear to us that, if we were to change this situation for the better, we must concentrate on the academic world and the universities, for the simple reason that they educate the new generations and the new leaders of the world. But right at the start we sorely needed broad support from our Czech and Slovak fellow citizens, especially here in America. And here we ran into resistance. On one hand, our countrymen here from earlier eras responded to our efforts with mistrust. This we managed to dispel to such an extent that our most important existing ethnic organization in America, the Československá národní rada americká (Czechoslovak National Council of America) in Chicago, with the considerable support of Vlasta Vrázová, helped us, through its local chapter in Washington, to begin our work toward launching the SVU. It was much more difficult to deal with our own political emigration of former Czechoslovak government ministers, parliamentary deputies and politicians, who made it very clear to us that they saw our campaign for an SVU as an intolerable intrusion into their own domain. That was why we emphasized from the very start that we would be an independent and nonpolitical organization. Credit goes above all to Dr. Němec that we succeeded in our efforts to make our identity academic and nonpolitical. It was his perseverence, his gradual and patient completion of successive organizational stages, and especially his ability to work with others (even in circumstances that were difficult for him personally) that made SVU a reality. It was also he who convinced Professor Václav Hlavatý, a mathematician known around the world, to become the first president of this new society. Hlavatý’s name by itself secured a favorable reception for SVU at universities near and far. Němec also secured support from artists and writers for SVU from its beginnings: he won over Jarmila Novotná, Rafael Kubelík, Rudolf Firkušný, the writer Radimský and others, while the politicians who stood up for our cause were Ladislav Feierabend, Juraj Slávik, Jozef Lettrich, Arnošt Heidrich and Štefan Osuský. Our working group in the Czechoslovak National Council of America’s Washington local chapter became the study group in the SVU organizing committee, and it was the group that drafted the first vision of the SVU. When the first SVU conference completed its work in 1961, the existence of SVU as an important cultural organization not just in America but also elsewhere was assured. Dr. Jaroslav Němec was the first Secretary General of the SVU. Later he also served as its president and was named a honorary member for his contributions. Outside of SVU, and we must wonder where he found the time for it while fully occupied at the National Institutes of Health, Němec did much research and writing, work that earned him an international reputation. We must mention at least one of his contributions to research: it is his International Bibliography of Medicolegal Serials, 1736-1967, for which he was awarded the first Regents Award for Scientific or Technical Achievement. But in the end SVU was the object to which Dr. Jaroslav Němec gave the greater part of his life, as he himself told us at the end of his address to the SVU in Prague, where he said, “My greatest thanks go to those SVU members who never faltered in their work for the Society in which I always found the meaning and fulfillment of my life.” He said this in June this year. And on October 7th, Jaroslav Němec died. Translated from Czech original by SVU member David Chroust.